His mom told "Today" that, strictly speaking, the sign is "mispronounced"
A mother in Utah taught both of her children to sign using American Sign Language before they could speak. 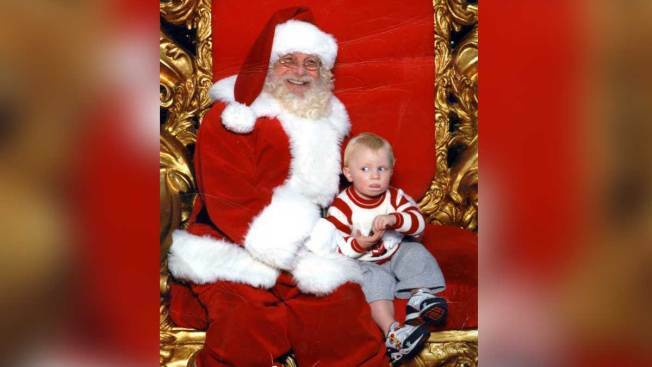 What she didn't expect was for her son to use his skill to communicate that he really didn't enjoy sitting in Santa's lap. Kerry Spencer told "Today" Parents that she didn't see Samuel's ASL sign for "help" until after the photo was taken. Her family has been laughing about the picture for years, but this year the Stevenson University professor, now living in Maryland, decided to tweet the photo. It's now gone viral, being retweeted thousands of times. Spencer told "Today" that, strictly speaking, the sign is "mispronounced." The thumb should be up, not sideways.